If you are ready to get started building your dream home in your dream community, please click here to review our complete Sugar Mill Design Review process, as well as access the forms you will need to submit your home design plans for the review and approval process. Restrictive Covenants, Architectural Regulations, and by the requirements contained in this document. Olde Towne. Meetings are held as requests are received. to waive these fees at its discretion. variance granted shall be considered unique and will not set precedence for future decisions. approval by Sugar Mill Olde Towne. a. The Lot Purchase Agreement. b. The Design Guidelines which consists of the Regulating Plan, the Urban Regulations, and the Architectural Regulations. d. The Design Review Guidelines and Procedures . e. The list of recommended architects, designers, landscape architects, and approved builders. a. Form A - Preliminary Plan Review Application - enclosed within the pdf. Building footprints with entries, porches and balconies delineated and overhangs shown as dashed lines. Drives and walks, with dimensions of each. Existing trees shown, if any. Porches, balconies, doors, and windows. Principal materials rendered and specified. Height of each floor, eave and maximum height in relation to ground level. and the justification based on merit or hardship. Check in the amount of $150.00 payable to Abell+Crozier Architects. a. Form A: Preliminary Plan Review Application bearing Sugar Mill Olde Towne stamp of approval. Rooms dimensioned and uses labeled. All windows and doors with swings shown. All overhangs of doors and roofs as dashed lines. Total square footage (enclosed and porches shown separately). Others as requested by Sugar Mill Olde Towne. Landscape Plan delineating planted area and new plantings by common species names. Variances: If there are any variances to The Design Guidelines, submit a description of them and the justification based on merit or hardship. Check in the amount of $300.00 payable to Abell+Crozier Architects. Sugar Mill Olde Towne will either approve, approve with stipulations, or deny continued construction. The owner may also be asked by Sugar Mill Olde Towne to stake out the building, garden walls, fences, and trees to be removed. All copies of drawings submitted will be filed with the Rutter Land Company. If you have not selected a Builder by this time, you should do so now. 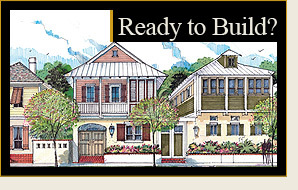 See Approved List of Builders , provided by Sugar Mill Olde Towne. Please click here for complete Design Review Guidelines and Procedures pdf file, or Contact Us with any further questions about our process.